Currently there is no single model to apply to all aspects of the iris and its psychological and physical correlates. There are numerous partially acceptable models in development, and what is needed is to sort it all out and place them on a larger 'cognitive map' so we may visualize how they relate to each other and the purpose served by each one. There are many fragmented and simplistic beliefs in circulation which muddy the waters, and those need to be collected up and put in their right place. The two primary macroscopic physical attributes of the iris as recorded photographically are color and elevation (along with the shape & size of the pupil and iris angle as inner and outer boundary curves delimiting the region being modeled). In iris analysis, what is considered primarily is: 1. variations in iris color and 2. variations in iris surface texture. Chromatic and textural variations in the iris are the two dimensions of jewelness and flowerness (variation in pigment and lacunae). A good place to start in an iris model is to have a representation of the shape and color of its surface, since the data source is photographic. These attributes are most conveniently mapped in cylindrical coordinates (rho-theta-z space). By expressing elevation as z(r,t) and selecting the relatively simple case of modeling iris surface contour as a single-valued surface function (rather than the 3-d network structure that it really is), the Fourier spectrum of z(t) for any r then gives a robust texture metric. Having a geometric model is the basis for a model of color-spot positions and their reflex correlates. It is also the basis for a descriptive model of color change. A series of snapshot descriptions of the same iris over time can be compressed using differential expressions (I, d1I, d2I, d3I, etc). As the symbolic basis of a representational model, the cylindrical geometric coordinates also serve to model textural properties and changes. An acceptable theory of positions is self-contained, for example a homeostatic model is a self-regulating mechanism. The reflex circuit model (which goes way beyond the iris) is like the system 'hardware; the habitual response patterns that develop (after the condition-response model of B.F. Skinner) are like adaptive software programs running on the system. These 'programs' exist on several levels, ranging from physiological to behavioral. With this view it is easy to see why reflex mappings have been found: every part of the body is a holographic representation of the entire body. This is most obvious at the DNA level, but it follows that a correlation would exist between the phenotypic attributes of the iris and those of the whole body. In this light, the iris can be seen as a hologram of one's personality. These concepts are mostly beyond debate outside of the medical world, while generally beyond grasp within it. A theory of color spot formation should be able to apply to the formation mechanism of freckles and age spots. It also should be able to relate across races. The relatively dense pigmentation of the anterior border layer in the brown eye for example, signifies a greater pigmentation response; a model that assigns a particular interpretation to the amount of pigment would identify physical and psychological correlates in these people. 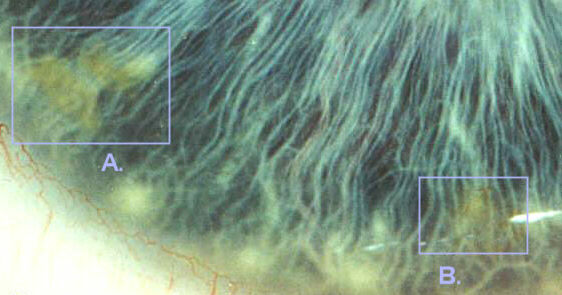 Pigment granules are found in the anterior border layer of all irises except the albino. The mechanism of formation for this type of pigmentation is active in all (non-albino) people, as it is in the skin, hair and elsewhere. However it operates at different levels, creating the normal distribution of pigmentation, ranging from light blue to dark brown. Pigment that occurs in focal regions (as opposed to diffuse) may have a formation mechanism that is different in ways, but there will also be similarities. The diffuse color gradient often seen radiating upward in the blue-green eye from the collarette out could be a debris field of inorganic solids that have been deposited along the way as they are carried by the aqueous outflow to Schlemm's canal. Since they are often concentrated around fibers, they could be pulled to them like iron filings to a magnet. Alternatively: 1. they could arrive by passing through the iris stroma, or 2. they could be a form of precipitated serous exudate, originating from the blood flow. The phototropic response model has been getting more attention recently, and it is something like this: the color spots are formed as a localized, defensive immune response to light. The localization is due to the reflex circuit that links the iris locality to associated somatic region, combined with hypersensitivity in that region. The return signal is leading to the formation of color spots as a narrow shield in the iris region (which may or may not have a circumscribed boundary), a defense mechanism designed to attenuate the spurious unwanted signals. The light-shielding model is derived from the empirical data and has been studied by Velchover and Romashov. It is in one sense overly complex as a model, has some plausible elements to it, and yet does not explain the formation mechanism in the case of non-positional correlates. The research into photochromo-iridotherapy by the Italians after Rizzo is providing evidence for the position-specific iris-organ reflex circuit. This research has found that organ areas may be influenced by directing a focussed spot of light onto the associated zone of the anterior iris surface. For example, a concentrated spot (less than 1 mm in diameter) of red light in the heart zone will elicit an increase in the heart rate over stimulation of other areas. It seems likely that the posterior pigment epithelium evolved to provide an opaque diaphragm to serve the iris function, however the pigment near the anterior layers are often situated on the rim of a lacunae, and are frequently found clustered around blood vessels. Therefore rather than serving to shield light from more inner parts of the eye it seems more like that they either 1. originate from the blood stream as a form of exudate or 2. are drawn to settle near them due to chemical and electromagnetic forces. A reasonable conjecture is that the more diffuse color flares (which often appear as a light dusting of color particles) arrive at their location via the aqueous outflow. The aqueous is like colorless blood and nourishes the cornea and lens which have to be avascular for optical clarity; the aqueous may also circulate nutrients originating from the iris vasculature to the avascular transparent tissue. A. Hyperpigmented lesion is dense with a circumscribed boundary. B. Early stage of peripheral yellow coloration near Brushfield's Spot (note proximity to vascularized radial). The concentrated hyperpigmented patches appear to originate from the bloodstream. Localization of these patches may be attributed to increased electrical activity in the radial zone combined with increased vascular permeability. Hematogenic eyes may also derive their greater pigmentation from increased vessel permeability. This would also account for the greater pigmentation typically found throughout the body of the hematogenic. Temperature and angle of the sun may also be exogenous evolutionary factors affecting vessel permeability and resulting in more baseline pigmentation among the equatorial races. Abnormal vessel permeability is a key factor implicated in many systemic and progressive failures, such as diabetes and cystoid macular edema, where the fenestrations of the capillaries near the macula become expanded to allow the serous exudate to fill spaces in the outer plexiform layer of Henle. 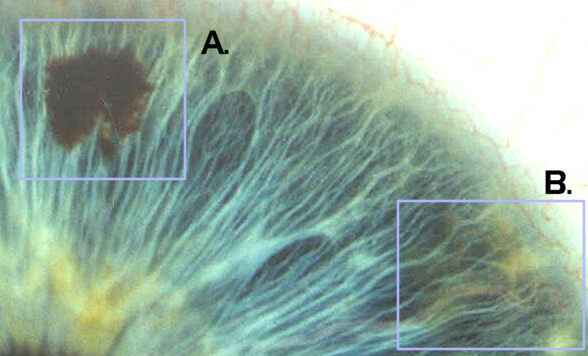 The mechanism responsible for pigmentation can be considered a logical consequence of a homeostatic (auto-balancing) circuit, and the specific distribution of pigmentation around the circle of the iris as it appears at the macroscopic scale illustrates local variations in the pigmentation response. Whether the pigment formation response is purely a local phenomenon or is a reflexive indicator of activity elswhere in the body is the central issue in the orthodox denial view. Note beginnings of yellow coloration taking place at A. and B. Pigmentation deposits coincide with vascular cluster and Brushfield's Spots. Pigmentation effect may be secondary to serous exudation, or a deposition of material carried by the aqueous outflow. Localization may be due to chemo-magnetic attraction of the neurovascular bundle. Color spot formation (i.e. pigmentation response) appears to be related to the immune system. A common interpretation in mainstream iridology is that they are trash piles of unwanted debris that have not been collected and taken away by the lymph/immune system. This viewpoint is na�ve but not without its merit as the statement of the "accumulated pigment granules as an indicator of toxic settlements in the associated body region" school of thought. This is not much different from the "pigment as records of events" or "pigments as a sign of weakness." These concepts are quite different from the Rayid Model which views the iris features as gifts of talent and opportunities for experience. The models are all similar in advising the imbalances be compensated for to arrive at a greater equanimity of being. The iris is an elegant and concise holistic recording, and offers a direct illustration of the structural and functional attributes of the vascular and nervous systems. Since the iris must have vascularity, the manner in which the vascularization has taken place in the ring-shaped context, will reflect another level of the person into this representation. Constitutional traits (physical and psychological) are indicated by the quality of the iris structure. The pigmentation response varies from 12:00 to 6:00 in accordance to the reactance of the referred region of the body (corresponding to reflex areas) from head to toe. This is the empirical data. The reflex pathway is well-known as a model in many alternative fields. In many cases (such as acupressure or chiropractic) the reflex mapping is used in a therapeutic mode. In iris analysis the reflex mapping is used in a diagnostic or interpretive mode, with the basis being that there is a correspondence between the specific features of the iris and the referred regions of the body. This includes the qualitative and quantitative properties of the pigment distribution. In all systems the positional correlate is only part of the interpretation of iris features. However the positional mapping of reflex indicators are almost always arranged from head to toe as the region is divided from top to bottom. For example in foot reflexology, the big toe is related to the head, with the heel end related to the lower part of the body. In Peter Mandel's Energy Emission Analysis, the top of the body is correlated to the upper tip of the finger's kirlian chromatograph, etc. Rayid is much more than an interpretive model, it is a theory of personality and relationship. The fact that the iris can be decoded to represent personality traits as well as physical traits is serendipity, or at least secondary. Positional considerations are not the primary result from a Rayid evaluation. The positional significance of jewels and flowers is the detail view in psychological or physical analysis, just as constitutional factors are derived from the global view as the primary consideration. Personality may be defined as the unique manner in which one perceives, processes and responds to environmental influences, including information as well as situations. Being an adaptive system, a person will typically form response habits, which may then be seen as defining their personality. Empirically, there is a good correlation between personality traits and iris coloration (as well as texture). I asked Daniele LoRito by email for the interpretative difference between a color spot vs. a lacunae on the collarette, and his reply was in agreement with the Rayid model on the relative significance of these features. In his own way he is arriving at conclusions which support and extend the Rayid model. The scientific explanation is a model-in-process (a first approximation) and the understandings will be improved and refined as it is fitted to increasing amounts of data. All diagnostic and therapeutic modalities can benefit from a better understanding of iris processes. For example, by recognizing the importance of the principle of duality (e.g. jewels and flowers being of complementary personalities, with the complementary J-F relationship having a greater relative capacity for emotional dynamic, and thus being more conducive to intimate relationship than the similars relationship, such as J-J or F-F, which tends to work better for vocational or avocational ones) and acknowledging the divine nature of one's traits (color spots and lacunae viewed as indicating one's special gifts and talents), the Rayid model helps one focus on and identify the client's innate strengths (positive mental and emotional traits) and derive a health plan that is tailored to work with their constitutional personality, while most physical models would view these signs as indicating inherent weakness and endogenous toxification ("you were born with this list of weaknesses and you have acquired toxicity in these organs..."). For more info on Rayid see the Rayid Website.